VANDELS is an ESO public spectroscopic survey targeting high-redshift galaxies within the Chandra Deep Field South (CDFS) and UKIDSS Ultra Deep Survey (UDS) survey fields. 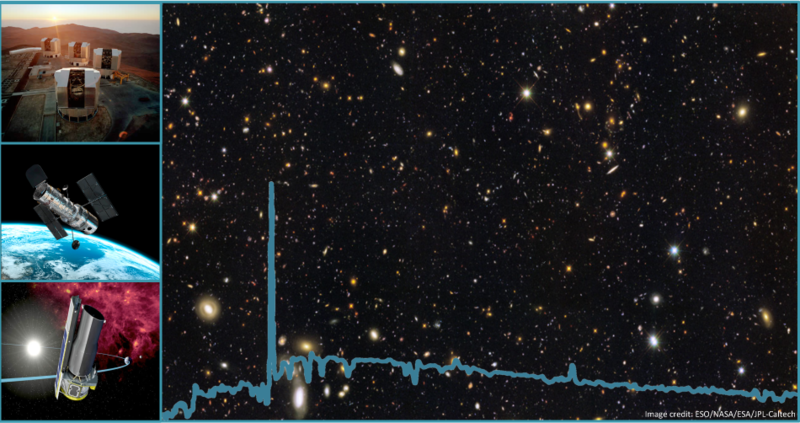 Specifically, VANDELS will use the VIMOS multi-object spectrograph to obtain ultra-deep, medium resolution, optical spectra (0.48μm-1.0μm) of around 2500 high-redshift galaxies, the majority of which will be selected from the HST imaging of the CDFS and UDS fields provided by the CANDELS survey. Combining the ultra-deep VANDELS spectroscopy with the best available optical+nearIR+Spitzer imaging will produce a unique legacy dataset, capable of unveiling the physics underpinning high-redshift galaxy evolution. The principal targets for VANDELS spectroscopy will be star-forming galaxies at redshift z>2.5, when the Universe was less than 20% of its current age. By adopting a strategy of ultra-long exposure times, ranging from a minimum of 20 hours per source to a maximum of 80 hours per source, VANDELS is specifically designed to be the deepest ever spectroscopic survey of the high-redshift Universe. The fundamental science driver of the VANDELS survey is to move beyond basic redshift determination, providing spectra with sufficient signal-to-noise to investigate the astrophysics of high-redshift galaxy evolution via detailed absorption line studies of well defined samples of high-redshift galaxies. The primary galaxy samples targeted by VANDELS will be bright (HAB<24) star-forming galaxies in the redshift interval 2.5<z<5.5 and fainter (HAB<27) Lyman-break galaxies (LBGs) in the redshift interval 3.0<z<7.0. The aim is to combine the high signal-to-noise VANDELS spectra with the unparalleled multi-wavelength photometry, to produce accurate measurements of stellar mass, star-formation rates, stellar metallicities and gas outflow rates. This information will provide important new insights into the evolution of the galaxy stellar-mass function, the cosmic star-formation rate density and the build-up of the galaxy mass-metallicity relation. In addition, VANDELS will also investigate the descendants of high-redshift star-forming galaxies, by targeting a large sample of bright (HAB<22.5) passive galaxies at redshifts 1.5<z<2.5. Accurate determinations of the typical ages, star-formation rates, metallicities and dust content of this galaxy population will provide new insights into star-formation quenching and the build-up of the strong colour bi-modality observed at z<1.